Yesterday we went to Ightham Mote, a 14th Century moated manor house in Kent owned by the National Trust. They were running a special event for Fathers Day that included fishing in the moat, a classic car display and games on the lawn. We went for Fathers Day last year and had a really wonderful time. 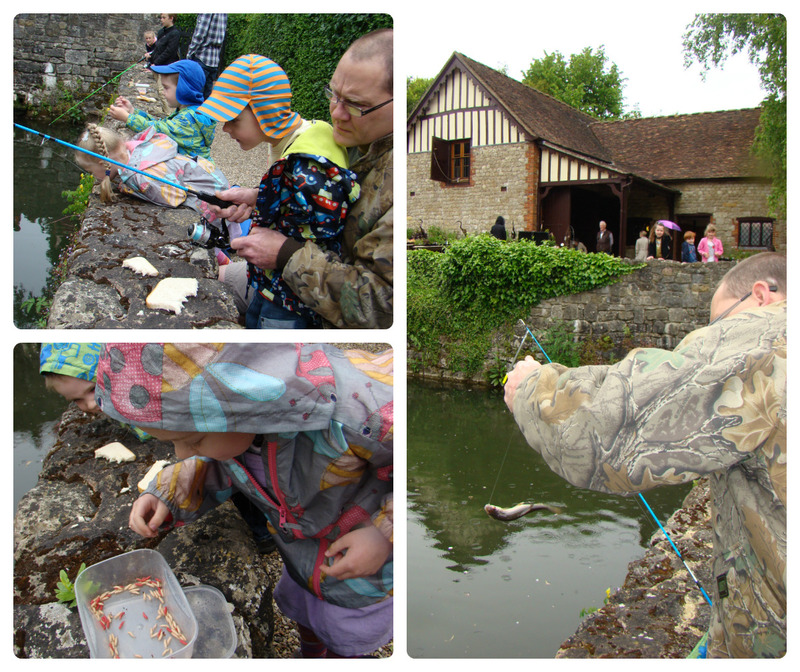 It was a beautiful sunny day, we caught several fish in the moat and Jasmine developed a love of maggots! The weather didn’t look promising for this year but we were keen to go again, remembering how good it was last time. So we packed our picnic and raincoats and set off, talking about the fish we were going to catch and the kids memories of last year. We arrived just before lunch and decided to have a go at fishing first. As we were waiting for a rod to become free we didn’t see many people catching fish. I think this should have told us something! We fished for around 45 minutes and we caught one fish! Just one! It was caught during Ben’s turn at holding the rod and so he was very proud of himself! Thomas and Jasmine were desperate to catch a fish too but they just weren’t biting. We were all getting hungry and a little fed up so we decided to give up and go for our picnic, with the promise that we’d try again a little later. By this time it has also started raining, so we headed for the Discovery Den to eat. The Discovery Den is set at the back of the pleasure gardens so once everything was eaten the kids explored the grounds for a while, trip-trapping over the trolls bridge, jumping across the stream and peering into the water. We had promised the kids a treat from the shop for their pudding so this was where we headed next. This was probably the biggest mistake of the day and set the tone for the rest of the afternoon. The kids spotted the toys and bits in the shop so I said they could go and have a look. I thought I might let them buy something small and inexpensive but Thomas saw a Bug Spotter pack for around £10. I explained that he couldn’t have it because it was too much money but asked if he would like a smaller, less expensive bug catcher on a lower shelf instead. He refused and threw/deliberately dropped the bug catcher to the ground. I’m afraid I got rather cross at that and told him he had to leave the shop as we wouldn’t be buying anything. Gordon bought some chocolates, but even novelty chocolates didn’t improve the mood after that as all the kids wanted was to go back in the shop to get toys. Still with moaning kids, we tried some games on the lawn to see if that would improve the mood and it did a little, but Thomas was now wound up so nothing was going to be easy. Jasmine and I played a couple of games of noughts and crosses and all 3 kids tried skipping with skipping ropes, which was quite funny! And then we went back to have another go at fishing. We thought about going to look round the house but, because the kids were getting tired and were still moaning about getting no toys, we decided that an outdoor activity would be better and surely we’d catch another fish and cheer them all up. Sadly, we were wrong and after only ten or fifteen minutes of fishing we’d caught nothing and the boys especially were getting silly. It was obvious the best thing to do would be to go home. Of course, the boys didn’t agree and screamed the whole way to the car and for a good few minutes once we’d reached the car. It wasn’t a particularly good end to the day but Ben fell asleep about half way home and Thomas was very quiet for the whole journey so it was obviously the right decision to leave when we did. All in all we did have a good day and, assuming the event is running again next year we’ll go back. 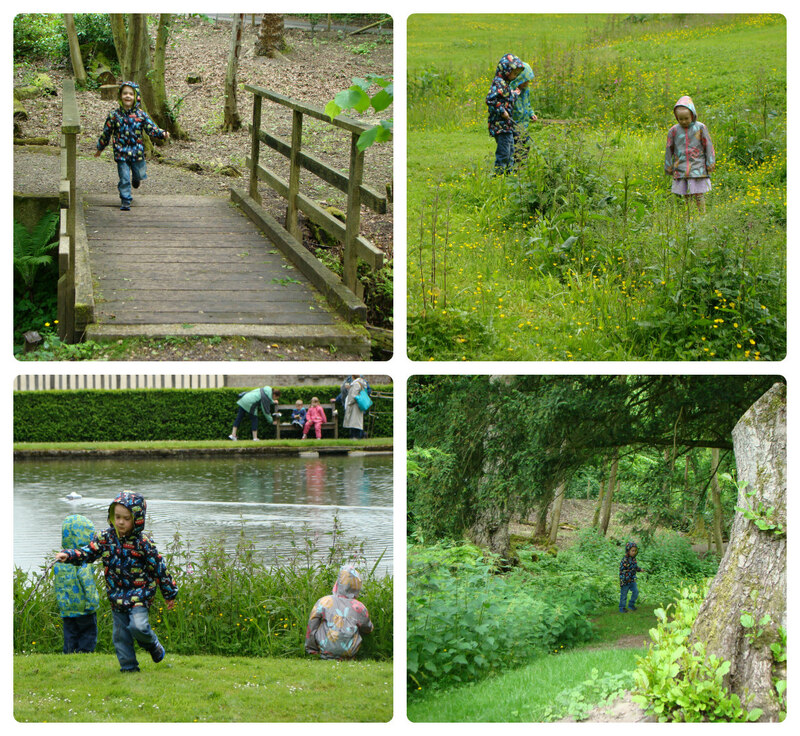 Ightham Mote is a really lovely place with a lot more to do than we managed yesterday. 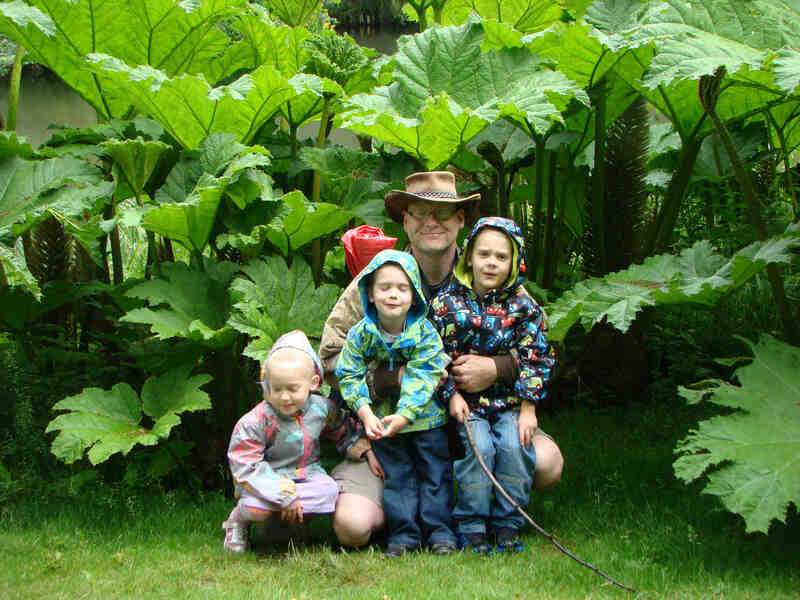 If nothing else we need to go back to take another Fathers Day photograph of Gordon and the kids under the giant rhubarb!